There is a difference between communicating policy decisions regarding oil contracts and engaging citizens in the actual process of oil contracting. In the first part, citizens neither play a part in defining the terms, conditions and clauses stipulated in oil contracts nor do they determine how final decisions regarding oil contracts between governments and the extractive industries are made. Contracting processes are not participatory while information regarding financial terms negotiated in the contracts are not made public until the deal is sealed. Official decisions are merely communicated to the citizens after the fact. In the second part, governments publish contracts. Citizens can also take certain steps towards defining the relationship between governments and private/public extractive companies and ensuring the transparency of those deals. They monitor bidding processes; have information about contract terms especially regarding the fiscals and environmental protection measures; can monitor contract performance and can demand accountability when there is mismanagement and corruption. It is important for African governments to commit to making the terms of extractive industry contracts available to the public. Continuing to shroud those deals in secrecy defeats the noble objective of open contracting and contract transparency. 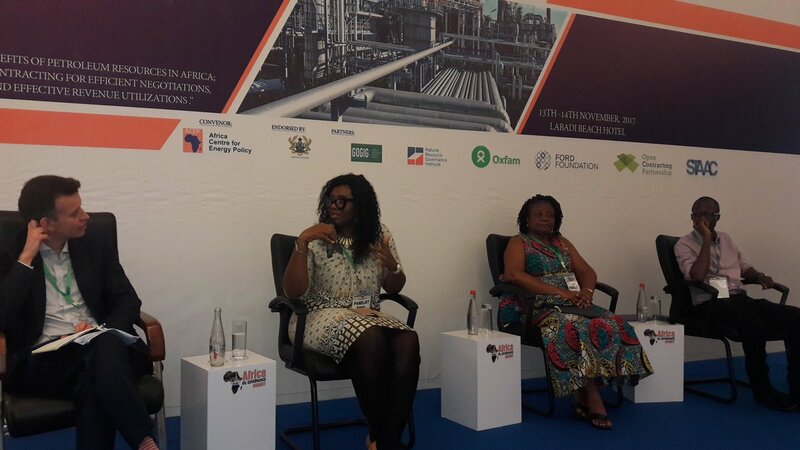 SPACES FOR CHANGE’s executive director, Victoria Ohaeri, made this call at the just concluded 3rd Africa Oil Governance Summit organized by the Africa Centre for Energy Policy (ACEP) in collaboration with Ghana’s Energy Ministry on November 13-14, 2017, in Accra, Ghana, West Africa. Ohaeri was a speaker at the panel discussing, “Rolling Back the Gains of Open Contracting: The Case of Revenue Mismanagement in Africa”. The panel comprising activists and government officials from the Ministries of Energy in Ghana, Nigeria, Kenya and the United Kingdom, featured expert analysis of the various oil regimes governing the transparency of extractive contracts, including the benefits of making the contracts easily accessible to citizens. The theme for this year’s edition is “MAXIMIZING THE BENEFITS OF PETROLEUM RESOURCES IN AFRICA; THE ROLE OF OPEN CONTRACTING FOR EFFICIENT NEGOTIATIONS AND EFFECTIVE REVENUE UTILIZATION.“ Many African countries are endowed with significant oil and gas resources. Recent developments and discoveries suggest that more countries will soon become oil and gas producers across the continent. To benefit optimally from the oil resource, countries are recognising the role of transparency in the award of oil contracts across the value chain through subscription to transparency standards such as the Extractive Industries Transparency Initiative (EITI), Open Data Standards, and adoption of national laws on open contracting.